First impressions count, and nowhere more so than a show flat at one of London’s finest new developments – a space designed to create a dazzling first impression. 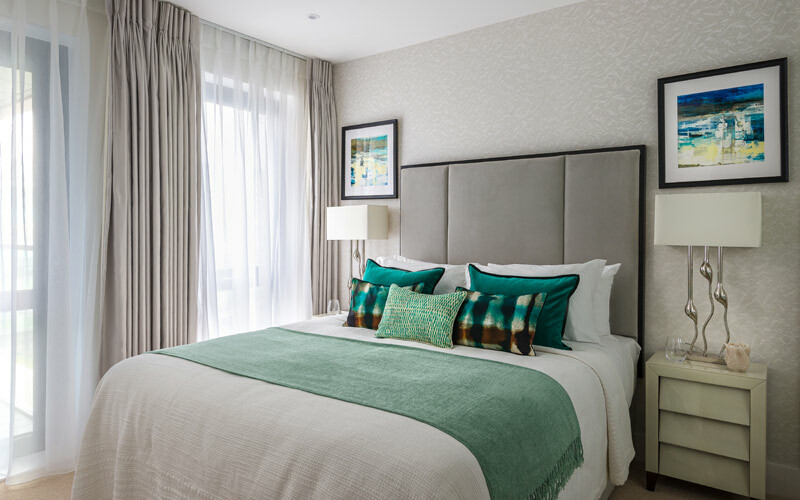 When leading property developer Barratt asked ani M to style a show flat for their new residential development Putney Rise, our interior design team set out to give the space an intimate and homely feel, perfect for all seasons. Adopting an understated elegance and a palette of soothing neutrals, the team swiftly transformed this two bedroom apartment into a peaceful haven. 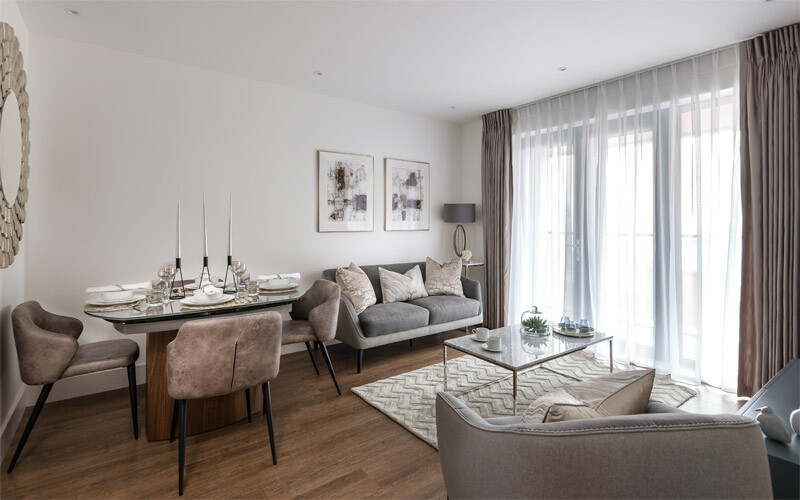 Having worked closely with the high-profile developer on a number of show flat interiors, it was the team’s furnishing and design expertise, combined with a careful attention to detail, that successfully transformed Barratt’s vision for the apartment into a stunning and highly marketable reality. With a relaxed interior concept in mind, layers of soft colours and textures were used in abundance. In the living room, delicate metallic hues were set against deep-tone backdrops and shadowy neutrals. A sumptuous grey sofa and lounge chair set the scene for a warm and inviting room, with decorative accents and elegant drapery adding a sense of luxury to the design. 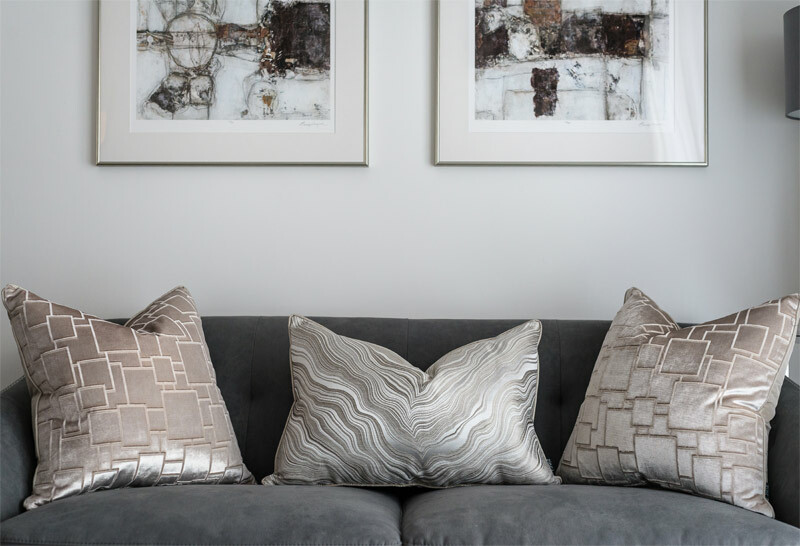 Stylish cushions give a high-fashion accent to the home décor, with their attention-grabbing patterns and classy metallic finish. On the crisp white walls, striking abstract art pieces lend a unequivocally modern element to the living room’s space. From candle holders to succulents, fine details sit pretty on a marble top table, whilst one-of-a-kind ceramic pieces decorate a sleek cabinet, effortlessly blending rustic style with modern appeal. The team designed a carefully curated dining area, merging comfort and beauty to create a space where guests and family will want to linger. A subtle touch of shimmering metal from the stemmed wine glasses, napkin holders and statuesque candles act as a stunning contrast to the mocha coloured dining chairs. Fitting in seamlessly with the metallic theme, a geometric wall mirror gives the corner a wow factor and extra luxe finish. 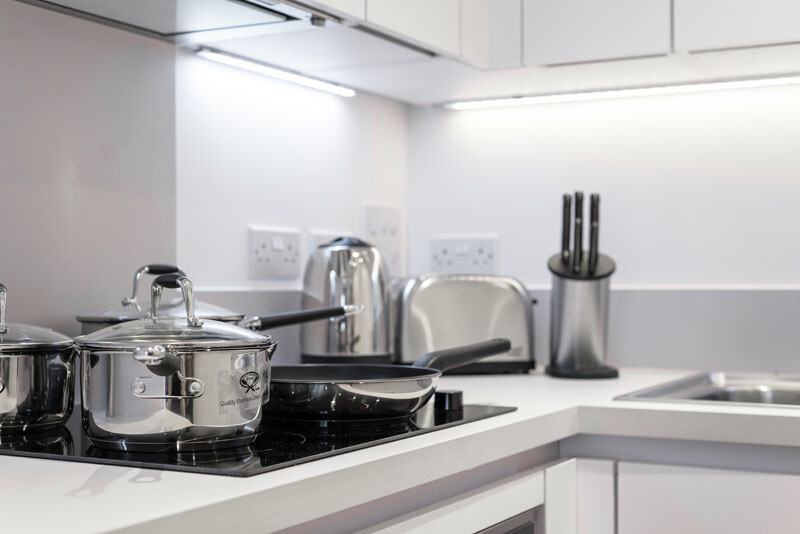 The show flat’s minimal kitchen design is finished with sleek, high-tech kitchen appliances, perfect for anyone from the casual cook to the gourmet chef with a flair for style. Its simple and sophisticated feel combines aesthetics with functionality and elegance. In the bedrooms, soft textures and accent pillows create an everyday luxury and extra comfort. In keeping with the muted palette, the layering of grey shades with the curtains, walls and upholstered headboard creates a sense of depth and soft contrasts, whilst punchy, electric colours give the bedroom a mood-lifting ambiance. In a nod to Pantone’s Colour of the Year, soft furnishings in vivid shades of green provide a harmony in the room that is both calming and revitalising – the perfect setting to unwind after a long day. Not forgetting that good interior design is all in the details, the team incorporated various ornaments on the bedside and dressing table, to soften the room and give it a more homely feel. With a more subdued colour scheme, a cosy second bedroom mixes classic design with a bold, modern flair. Deep blues add a richness that contrasts beautifully with the room’s cooler tones. Dainty mauve lampshades are gorgeously complemented with eclectic patterns from the accent pillows, whilst eye-catching artwork and a royal blue headboard make a stylish statement. It is the blend of sensual fabrics and harmonising colours that make this bedroom a delightfully cosy and indulgent retreat. As the developers were flexible with the concept and scheme for the property, our team were able to use their creativity and skill to transform an empty show flat into a beautiful, inviting home full of character – one to be enjoyed throughout the seasons. 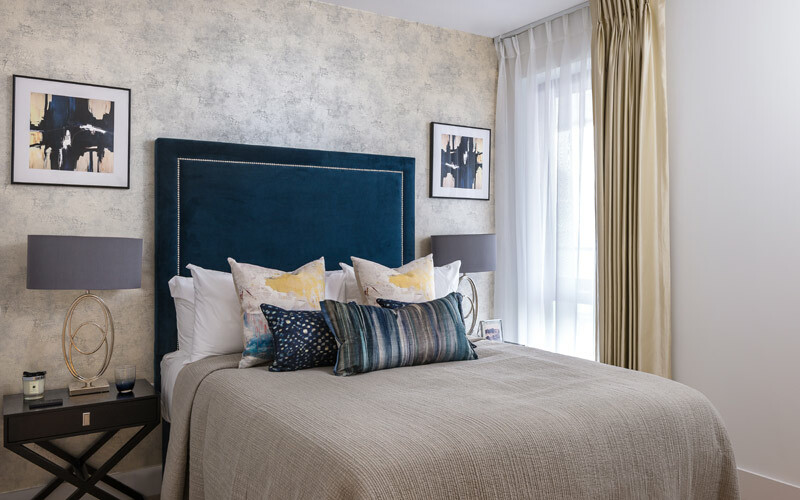 If you would like advice on creating a versatile, effortlessly stylish and professionally-designed scheme for your show apartment, get in touch with us today.